Approximately 4km from the nearest road accessible beach at Badenscallie Bay, the island’s exposed position makes it a challenging yet rewarding goal. Taking into account the exposure to wind and waves the crossing via Bottle Island is achievable to the experienced paddler. Separated by a narrow rocky isthmus the two sides of the island have plenty to explore from the southern craggy cliffs offering excellent fishing to the shallow bays and grassy summits giving superb views. The island has a superb sense of remoteness leaving the paddler in the company of seabirds, seal and even the illusive storm petrel which venture out at dawn and dusk. The island has no fresh water but there are no shortage of fantastic tent spots. Wildlife is prolific on the skerries ranging from otter to the colourful six spotted burnet moth. We encourage respectful caution during the breeding season so as not to disturb the seal colonies and their pups and the many breeding birds which call the island home. Please avoid walking across the rock spit above the high-tide line between the spring and summer months ( April-September ) there are a number of rare and protected bird species that nest on the ground. Disturbing them will severely affect their chances of increasing the future breeding population. Excellent for a short day blast or a spectacular sunset paddle, Isle Martin offers a spectacular sandstone cliffs, hidden shingle beaches and the chance to encounter many seabirds which colonise the northern shore. Late at night it is a fairly reliable place to sight sea eagles, otters and seals in abundance. Whilst Isle Martin can be exposed to western weather it is often a good sheltered option for northerly wind. Landing on the island’s main bay gives access to the historic houses managed by the Isle Martin trust. Circumnavigating Isle Ristol and Eilean Mullagrach is a classic Summer Isle day out. A short hope across from Altandhu campsite or Old Dornie harbour brings you across to Isle Ristol with relative ease. From the mainland it is possible to see the island’s spectacular shell sand beach which sweeps across a wide bay on the northern shore, it is a lovely spot for a picnic or a night out. By night the resident Roe deer and a short eared owl are often nearby and curious sheep often come to inspect the kayaks and our tents. Again beware the eastern side of the bay which is home to ground nesting birds between April-July. Water is sparse on the island, although a historic reservoir behind the beach offers somewhat of a bog if you have good filters to clean water from it. On the more exposed south and western coastline the island harbours a battered and rugged coast, perfect for rock hopping and exploring the many narrow channels into the rocks. 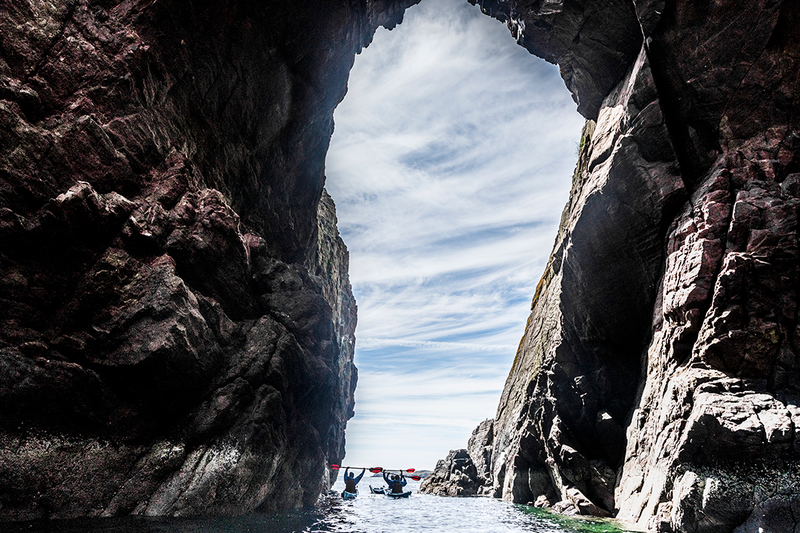 A short paddle across to Eilean Mullagrach brings some spectacular exploring with deep caves and tremendous arch ways, make sure to bring a headtorch for this one! Unlike Ristol, Eilean Mullagrach is almost un-landable except for an interesting roped access point on the northern crags. A reasonable tidal flow pushes through the channel between the two islands which although is not strong it often creates turbulent waves which in the right conditions and with proper preparation can be a good place to practice a few skills. Western Mullagrach is also impressive but more often than not battered by swell and waves and requires calmer conditions. Leaving from Badentarbet bay or Old Dornie a short kilometre kilometre crossing to brings you to the island archipelagos between Tanera Mor and Tanera Beag. From here you are in the main chain of the Summer Isles and can easily spend hours exploring the many small islands, shallow sandy channels and featured cliffs. The crown in the jewel is hidden on the south eastern corner of Tanera Beag. Amidst the sandstone cliffs is a spectacular sandstone arch carved by years of wind and wave. In calm conditions with mid to high tide it is possible to paddle in and out beneath it and on springs all the way around, normally it is a case of reversing in and exiting the way you have come. A short way along the coast is another impressive feature known as the ‘Cathedral cave.’ It’s namesake is not just for it’s tremendous size which is even big enough for the local tour boats to enter but for being a hidden chapel where sermons were delivered from a rocky plinth and archway above the cave to locals moored in boats below. I would be amiss to mention the Summer Isle and Coigach area without mentioning this classic sandy beach. Just as good a spot for a play as a place to start or finish a day around the Coigach peninsula it is a stunning location. A short carry down from the road west of the bay offers super easy access and on high tides a longer paddle in from the southern road junction is also possible, but prepare for a long carry back when the tide falls. Be it a sunny day lounging in the dunes, or a cheeky surf session when possible (the bay is normally surprisingly sheltered to surf), there is always something to do at Achnahaird. Also a popular spot with snorkelling groups the shallow river flowing across the edge of the bay is full of skate, crabs and shellfish and the estuarine grasslands amidst the bay are lit up with the colour of pink sea Campian in early summer. Without a doubt this is a truly spectacular place to play, to camp and to enjoy that illusive summer sunset. As with all sea kayak adventures, always ensure you are suitably equipped and prepared for the conditions, check the weather forecast and carry a minimum of one means of communication. Always tell someone where you are going and when you will return. Stay safe and have fun.